Analysing shipyard marketing communications is anything but easy. We need to analyse the "luxury yacht" product in a market oriented type context. To do so we need only begin with analysis of the product luxury yacht in a marketing key, then pass on to the company communications of the shipyard before gradually getting down to specific analysis of shipyard marketing communication. But let's go step by step: what is a luxury yacht? What does it represent for the buyer? Why a luxury yacht and not another luxury purchase? These three questions are fundamental to understanding and definition, in a marketing key, of the product under analysis. A yacht is a product whose core benefit, meaning the advantage the customer gains from the purchase, is classifiable in two ways. On the one hand there is certainly the symbol of social success, i.e. the yacht as an expression of one's power and wealth, thus becoming a considerable status symbol; on the other hand there is an element linked to amusement, leisure, holidays, fun with family and friends. Nor must we exclude, at least for large vessels (custom mega yachts), the great pleasure of building a luxurious toy with which to express one's dreams and aspirations, the pleasure of owning a superyacht made to measure for oneself. This last core benefit presupposes high spending capacity by so called ultra high net worth individuals, since custom yachts lie within a very high price range. The yacht may therefore be defined as an object that embodies the image of pleasure, fun, life always lived to the full, inspiring admiration, envy and jealousy. The yacht is exuberant, fascinating and capable of offering an exclusive luxury to those who can buy it. More than anything else, a yacht reflects the personality of the individual. Inasmuch as it is an object of desire in no way taken for granted, the yacht must be enveloped in an absolutely specific communication that comes first of all from the image and values which the shipyards give with regard to themselves. In analysing shipyard communications we must firstly consider that these companies, in their normal dealings, enter into relationship with a decidedly varied public, and the purpose of communications is precisely to handle these public relations with view to acquiring information and transfer both informative and persuasive communications. In the specific sector of yachting, according to many professional advertising experts: "within the yachting sector we may speak of mediaeval communications because most shipyards carry out communications without any strategic design: they do it because it has to be done. Many yards don't think about the choices of communications and it isn't rare for certain yards to commission us to create their advertising message without defining the targets to pursue". Of course professional yacht marketing absolutely cannot make a choice like this, considering that communication, especially for this type of goods, has a high strategic value. 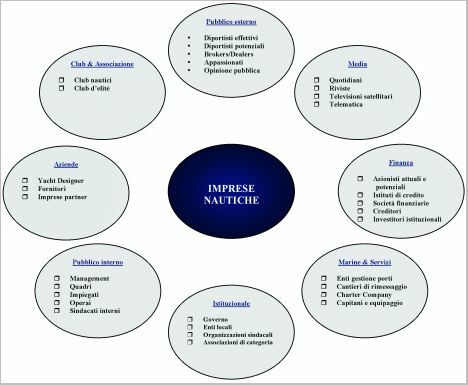 Before going into detailed analysis of shipbuilding companies' marketing communications, in the strict sense of the term, it would be useful to describe, given the reference scenario, some of the principal concepts regarding company communications in the luxury yacht segment. When we speak of company communications we intend that grouping of communication processes that a company creates with the precise intention of influencing the actions and attitudes of its reference target. These communication processes take place not only from the company to its public but must also work in the other direction, from the public to the company: the target objective is not a passive element, indeed it is a source of inexhaustible information that the company must be ready to assimilate. The environmental changes in the yacht sector such as intense internationalisation, global markets, evolution of the demand and of new technologies employed, changes of a business nature such as the advent of great holding companies, the development of more streamlined company structures, the development of polycentric structures (formerly networks), access to capital markets for financing growth programmes, and the growing importance of the intangible features of the boats themselves, have all determined the attribution of greater importance to the company's relational dimension. It is not by chance that we have witnessed, in recent years, an actual revolution in yacht-builders' communication processes, with the passage from haphazard communication to continual efforts towards synchronised management of the various communication instruments (figure 1). Today, in substance, the increased complexity of the markets, their global nature and greater competitiveness have made it indispensable that a series of messages should flow from the public to the company so the latter can produce for the market on the basis of the requirements, interests and tastes manifested thereby to the point of guiding company decisions. Shipyards today must therefore be stimulated, directed in their strategies and oriented in the basic choices of their operational situation by market pressures, thus transforming themselves into market driven companies. In dealing with company communication it is also important to analyse the relationship existing between management and communication. More precisely, as well as presenting a purely operational side (preparation and spreading of the message), communication equally presents a strategic component. In other words, the head of the firm should be first of all in charge of company communication and its strategic planning, defining objectives, reference publics and the necessary means and instruments. The operational tasks are then down to communications technicians who, on the basis of their duties, will fine-tune the individual communications programmes identified in the strategic phase. The strategic component of communications means an investment for the company and, as such, can only be evaluated and decided on by the head of the company who will also provide for allocation of the budget necessary for implementation. In the case of luxury yachts, empirical observations and the testimony of sector operators show that only the big groups attribute strategic significance to company communications while most of the yards, prevalently small to medium size, attribute no strategic value at all. Small shipyards, as pointed out earlier, have limited financial resources and a high technical concept of the product (product oriented company logic). But even small and medium yards should start developing communications projects closely correlated to company strategies. This is because the purpose of company communications is to create a powerful and attractive company image that allows the yard to obtain the necessary consensus in order to attract the external resources needed for carrying out its activity: consensus is necessary in order to achieve a competitive advantage. It is important to specify that each of these communication sectors must coexist and integrate with the others inasmuch as it is only through effective integration that strategic objectives may be achieved which the company has attributed to its communications plans and projects (global communications strategy). In the specific case of pleasure craft the main target public is of course yachtsmen (potential and effective). The company changes that have characterised the evolution of shipyards in recent years have brought about an increase in target public, and within this picture of change management there needs to be an updating of the company communications management process. Figure 2 shows the main shipyard targets. The list, which in no way claims to be exhaustive, supplies a first rough idea of professional shipyards' reference public. Having identified the main targets of shipyards we can now, at last, get right into marketing communication, which is the type of communication whose task is to turn a potential customer into an effective one. It is therefore a communication that acts directly on the behaviour of potential customers. Nonetheless we should not neglect the fact that marketing communication may have important fallout with regard to company positioning. In another sense marketing communication may have, over and above its aim of promoting a company product or products, that of promoting the company or brand image. It is important to point out that the world of yachting is a world of relationships that must be developed through development of promotional mixes aimed at its target public. In this reference context one notes the first signs of application also in this sector of techniques linked to customer relationship management (CRM) with view to reinforcing at strategic level relationships with the reference clientele. These are relationships that permit the company to reinforce brand loyalty and are therefore an advantage with regard to other reference competitors. Advertising communications within the axis of the four A's of communication (Awareness, Attitude, Action, Action two) are the most congenial instrument for creating awareness of the company's fame. If advertising is also creative it contributes to forming the image and to a certain extent the preference for or acceptance of the brand. With regard to the aims assigned to advertising communication, the most common error committed by many shipyards is to associate with advertising the single aim of increasing sales instead of favouring a behaviour considered useful for company development (think for example of the importance of brand fame with view to purchase choice etc.). The main purpose to be assigned to advertising communication, in the specific case of yachts, is improvement of the yard's image and reinforcement of brand prestige, over and above the fame of the models in the range, new models launched and so forth. The image of the yard and the prestige of the brand name are important assets for company development because the customer experiences them as notable purchasing factors. Considering the intrinsic features of luxury yachts, inasmuch as we are dealing with a very costly item of high social character, advertising communication certainly assumes a fundamental role in constructing the perception of luxury. The visual and textual descriptions used in the ad in fact allow the observer to infer the connotations of brand and product. The process of inferring attributes of status, prestige, dream and quality on the basis of its description - in connection with a product like a luxury yacht -is something to which the individual is naturally predisposed. 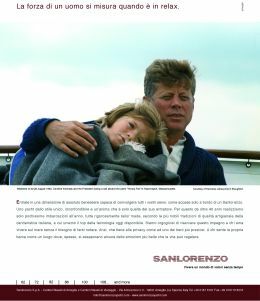 The role of advertising communication in giving a certain status to the product yacht is rendered concrete by the use of a certain symbolic language suited to imbuing the item with the attributes desired by the company. 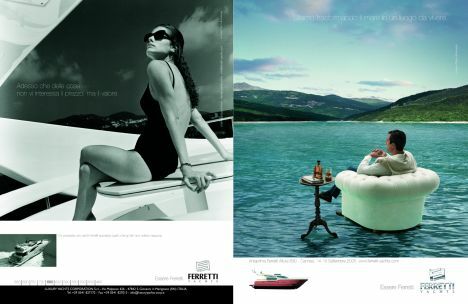 From analysis of advertising communication in the luxury yacht sector there emerges the affirmation of a trend characterised by an overturning of communicative techniques. 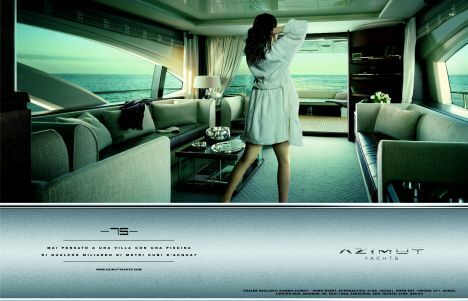 In particular, there has been a move from advertising featuring simple representation of the product yacht to an advertising that puts the emotional and sensational impact of luxury yachting in the foreground. 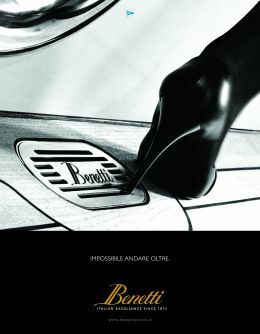 The latest advertising campaigns of Benetti, Ferretti Yacht, Azimut Yacht, San Lorenzo and Cnl-Admiral reflect this consolidation of a new paradigm of pleasure craft communications. But we'll be talking more widely of this and other things in the next Nautica Superyacht article.